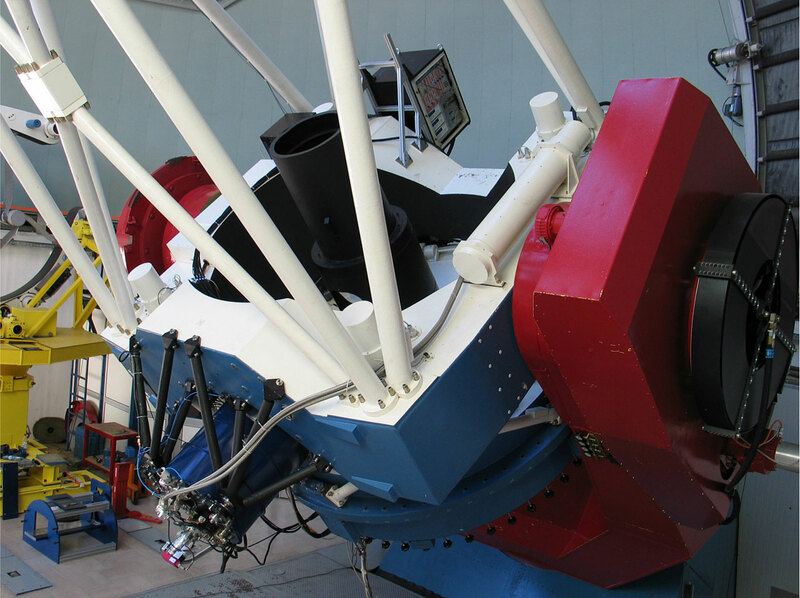 A new instrument has seen First Light at the ESO La Silla Observatory. Equipping the 2.2-m MPI/ESO telescope, GROND takes images simultaneously in seven colours. It will be mostly used to determine distances of gamma-ray bursts. Taking images in different filters simultaneously is important for the study of many astrophysical sources, and in particular of variable sources, such as close binaries or active galactic nuclei. But it is most crucial in the follow-up of gamma-ray bursts. Gamma-ray bursts (GRBs) are short flashes of energetic gamma-rays lasting from less than a second to several minutes. They release a tremendous quantity of energy in this short time making them the most powerful events since the Big Bang. Gamma-ray bursts, which are invisible to our eyes, are discovered by telescopes in space. After releasing their intense burst of high-energy radiation, they become detectable for a fleeting moment in the optical and in the near-infrared. This 'afterglow' fades very rapidly, making detailed analysis possible for only a few hours after the gamma-ray detection. This analysis is important in particular in order to determine the GRB's distance and, hence, intrinsic brightness. A first determination of the distance can be done by taking images through different filters, using the so-called photometric redshift . Because a typical GRB afterglow becomes 15 times fainter after just 10 minutes, and over 200 times fainter after an hour, it is important to observe the object in as many filters as possible simultaneously. "To make the determination of distance of far-away objects as accurate as possible, we decided to use four different filters in the optical and three different filters in the near-infrared," says Jochen Greiner, who led the development of the GROND instrument. GROND stands for Gamma-Ray burst Optical/Near-Infrared Detector. GROND takes thus images of the same region of the sky in 7 different filters. The field of view in the near-infrared is 10 times 10 arcminutes, or 1/7th the area of the Full Moon. It is smaller in the visible, slightly above 5 x 5 arcmin. GROND is presently in its commissioning phase and its first science demonstration has been achieved, showing that all technical systems work properly. 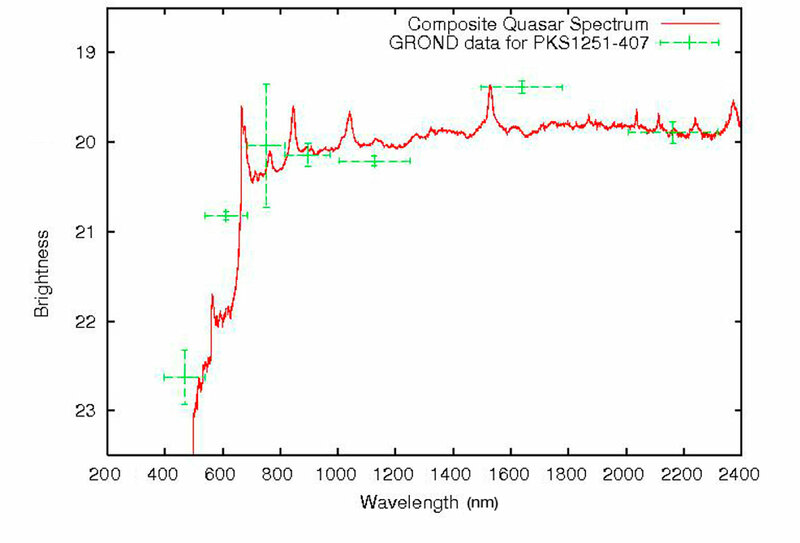 In particular, GROND observed a quasar located more than 12 billion light-years away. As for many instruments specialising in the follow-up of gamma-ray bursts, GROND can also be activated with a Rapid Response Mode (RRM): GRB alerts will be automatically fed into the system thus minimising the delay between the gamma-ray burst detection by a satellite and its observation by GROND. "The implementation of the RRM at the 2.2-m telescope is done in exactly the same way as for the VLT, and boosts ESO's leadership to offer observing systems with ultra fast response time towards GRB follow-up," says Michael Sterzik, Head of Science Operations Department at ESO La Silla. A dedicated data analysis pipeline is also being tested which will provide the distance of the burst a few minutes after the first observations. "Ultimately, the goal is to trigger ESO's VLT to perform spectroscopy of the source with fine-tuned settings, thereby maximising the scientific return of GRB follow-up observations of the VLT," says Greiner. GROND has been built by the Max-Planck Institute for Extraterrestrial Physics in collaboration with the Thüringer Landessternwarte Tautenburg. The photometric redshift method makes it possible to judge the distance to a remote celestial object (a galaxy, a quasar, a gamma-ray burst afterglow) from its measured colours. It is based on the proportionality between the distance and the velocity along the line of sight (Hubble's law) that reflects the expansion of the Universe. The larger the distance of an object is, the larger is its velocity and, due to the Doppler effect, the spectral shift of its emission towards longer (redder) wavelengths. Thus, the measured colour provides a rough indication of the distance.